February 8th is officially Taraji P. Henson Day! 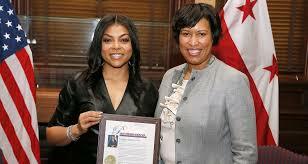 The 48-year-old actress was presented with the special honor on Friday afternoon (February 8) at the Office of the Mayor in Washington, D.C.
Mayor Muriel Bowser gave Taraji a Proclamation to the City, officially recognizing the day in her honor. “And then THIS HAPPENED!!!! I am just so honored‼️ From an #aroundthewaygirl with dreams I thank you @mayor_bowser and the entire city for riding with me for all of my life!!! 😩😂 #GodIs 🙏🏾💋💋💋,” Taraji wrote on her Instagram. Next What Alternatives Does APC Offer Kwarans?